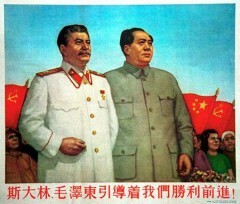 Commentary: Mao Zedong’s birthday greetings to Stalin | Fight Back! Living in a period of the bitterest suffering in our history, we Chinese people most urgently need help from others. The Book of Odes says, "A bird sings out to draw a friend's response." This aptly describes our present situation. There are so-called friends, self-styled friends of the Chinese people, whom even some Chinese unthinkingly accept as friends. But such friends can only be classed with Li Lin-fu, the prime minister in the Tang Dynasty who was notorious as a man with "honey on his lips and murder in his heart". They are indeed "friends" with "honey on their lips and murder in their hearts". Who are these people? They are the imperialists who profess sympathy with China. Stalin is the true friend of the cause of liberation of the Chinese people. No attempt to sow dissension, no lies and calumnies, can affect the Chinese people's whole-hearted love and respect for Stalin and our genuine friendship for the Soviet Union.